If you're a global or SharePoint admin in Office 365, you can convert any existing site to a hub site. We recommend selecting a communication site, or a team site that uses the new template. If you use a classic team site, the hub navigation will appear only on modern pages, and hub site settings will only appear on modern pages. Sites that are already associated with another hub can't be converted to a hub site. You can create up to 100 hub sites for an organization. There is no limit on the number of sites that can be associated with a hub site. When users associate their sites with a hub, it doesn't impact the permissions of either the hub site or the associated sites. It's important to make sure all users you allow to associate sites to the hub have permission to the hub. If you have Office 365 Germany, sign in at https://portal.office.de. If you have Office 365 operated by 21Vianet (China), sign in at https://login.partner.microsoftonline.cn/. Then select the Admin tile to open the admin center. If the classic SharePoint admin center appears, select Try it now to open the new SharePoint admin center. In the left pane of the new SharePoint admin center, select Active sites. Select the site, select Hub site, and then select Register as hub site. Using the Hub site menu, you can also associate a site with the hub site, change a site's association to a different hub site, or disassociate a site from a hub site. Enter a display name for the hub site and specify the individual users or security groups you want to allow to associate sites with the hub. If you leave the People who can associate sites with this hub box empty, any user can associate their site with the hub. If you later want to change the hub site display name or the list of people who can associate sites with the hub, you need to use PowerShell or go to hub site settings on the hub site. For info about using a site design that gets applied when sites join the hub, see Set up a site design for your hub site. For more info about site designs and site scripts, see SharePoint site design and site script overview. To learn how to use Microsoft PowerShell to create and manage hub sites, see Manage SharePoint hub sites. 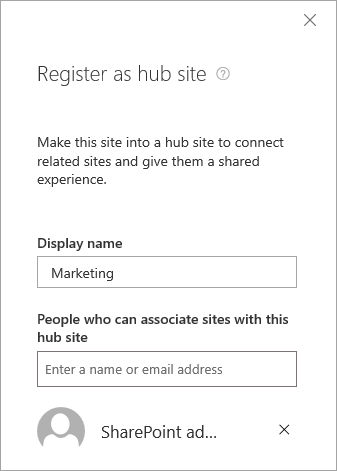 For info about how site owners can customize hub sites, see Set up your SharePoint hub site. For info about removing a hub site, see Remove a hub site.